This is about the level of intelligence we’ve learned to expect, when questioning any Tory! 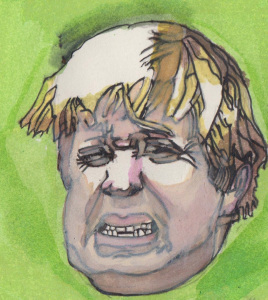 Boris Johnson: he really should eat more roughage. I found this video on YouTube of that interview Boris Johnson gave with Eddie Mair, in which the Tory leadership contender and former editor of the Spectator failed to answer Mair’s questions on what was in the Queen’s Speech for correcting harsher sentences against Blacks in the courts and improving the lives of the mentally ill. Boris couldn’t answer the first one, and after umming and ahhing tried to answer the second, before finding out that he couldn’t answer that one either, and tried to go back to answering the first question again. At which point Mair told him this wasn’t the Two Ronnies’ Mastermind Sketch, ‘Answering the Question before Last’.